When you create a new report, share it with other people on your team or in your organisation so that they can also benefit from it. There are several ways that you can share your new report with other people. In the list of reports, select the report. a. Choose More Commands , and then choose Share. b. In the Share Report dialog box, choose Add User/Team. c. In the Look Up Records dialog box, select the users or team you want to share the report with, and choose OK.
a. In the list of reports, select a report, and in the Collaborate group, click Share. b. Specify the users or teams you want to share the report with. If the report would be useful for all users, make it available to the organisation. In the list of reports, select the report, and on the command bar, choose Edit. a. On the command bar, choose Edit. b. On the Actions menu, choose Make Report Available to Organisation. a. In the Records group, choose Edit. Reports help you manage your progress towards your goals by helping you see how you’re doing. You can also track trends – which can give you an advantage over your competitors. For example it’s important for a sales team to know which product or service is selling and which is not doing so well. For a customer service team, it’s important to track the average time it takes to resolve an issue. Choose the report you want > Run Report. In Report Viewer dialog box, you can leave the search criteria as is, or change it as needed. 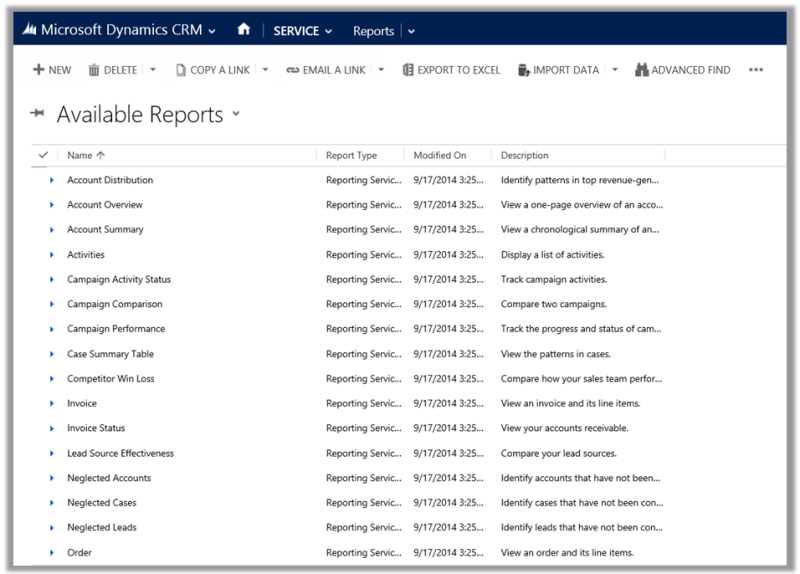 When Microsoft Dynamics CRM Online users print CRM data, they are effectively “exporting” that data from the security boundary provided by CRM Online to a less secure environment, in this case, to a piece of paper. An administrator has full control (at the user security role or entity level) over the data that can be extracted. However, after the data has been extracted it is no longer protected by the security boundary provided by CRM Online and is instead controlled directly by the customer.